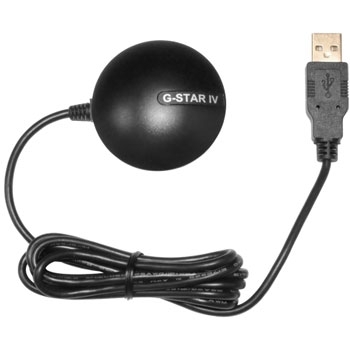 The BU-353S4, by USGlobalSat, GPS Receiver can be utilized in a variety of applications. With a non-slip base and compact design, the BU-353-S4 is completely self-contained and waterproof. It incorporates the latest SiRF Star IV GPS chipset and a 48-channel antenna so you receive the highest degree of GPS accuracy. Typical application may include, but not limited to marine, aviation, and commercial environments in such uses as fire truck, police cars, buses, RVs, utility & long haul vehicles. The extended 5 foot long cable allows for easy routing behind headliners and side panels to terminate at a USB connector for interfacing with your Laptop or PC. 6. USB interface connection port. 7. Waterproof and non-slip on the bottom.